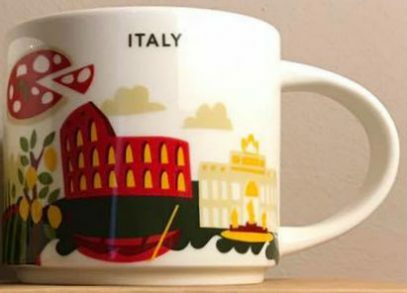 Here’s Starbucks You Are Here – Italy mug. It took Starbucks 47 years to open its first store in Italy. The reason is pretty obvious – Italians take coffee seriously and prefer drinking espresso on the run. They come to coffee shop or bar, order their espresso, drink it fast, pay and leave. It takes 5 minutes and this is quite different compared to the behavior of the common Starbucks customer. To be honest with you, I find myself disappointed with the lack of free space in Starbucks stores quite often. But who am I to argue with this business model, since it works ($25B in revenue in 2018, with $5.6B being an income). The new store occupies the spacious former post office in Piazza Cordusio, Milan. It has a coffee roaster, an on-site bakery and an affogato corner for ice-cream caffé. The interior design looks amazing and that’s what people might be coming for – the Starbucks experience. The espresso shot is quite expensive though – €1.8; which is almost twice the price you pay in the local bars. Just a reminder, this is the third ever Starbucks Roastery, with other two being in Seattle and Shanghai. This is another proof, how serious Starbucks is about coming to Italy.